After you have strung your Christmas lights around your house and decked your halls with trees and garlands it is time to think about what you will be serving to eat for Christmas. Figuring out what to serve for dinner is easy if you stick to the traditional feast of turkey, potatoes, and stuffing. For the grand finale of the meal serve a decadent cake topped with a DIY Christmas tree forest that is perfect for Christmas! 'Tis the season to be jolly, so get in the holiday spirit by making a playful fa la la dessert topper, based off of the popular Christmas carol Deck the Halls, that you can stick on the top of any dessert. In the Christmas decor aisle of stores, you will often find decorative small green bottle brush trees, but they can easily be given a fresh new look with a new color and then turned into a quick and easy cake topper perfect for the holiday season. In a hurry? Make these cute mini wreath toppers in under 10 minutes using ribbon, toothpicks and a fabric scrap to enhance your baked goods for your Christmas celebrations this year. Bring on the color by cutting Balsa wood into triangles and painting them either with a solid color or stripes to make this outstanding Christmas tree cake topper for your homemade or store bought cake. Top your cake with a modern Christmas wreath, but instead of the traditional pine needles make artificial pine branches out of crepe paper instead so there will be no chance of falling pine needles falling on your delicious desert. Across your handmade wreath, you can then string your own holiday message with a mini banner to make your cake look extra spectacular! Will you be bringing a bunch of cupcakes to your child's school for the annual holiday bake sale? If so you will need a quick way to decorate all those cupcakes in a festive way, and these sprinkle covered trees are perfect as you can download the template, cut out the design and stick the trees onto a toothpick to stick in the top of each cupcake. The holiday season is all about glitz and sparkle when it comes to decor and fashion so enhance your cupcakes with some glitter covered reindeer which can stand on the top of each cupcake. Paint small wooden disks with red and white to make your own faux peppermint candies which would be perfect for your peppermint cupcakes this holiday season. As peppermint is such a popular flavor around Christmas, this DIY cupcake topper is perfect. Instead of gluing normal peppermint candies to a stick, these handmade faux peppermint candies will not melt accidentally all over your cupcakes, and can easily be stored and reused. 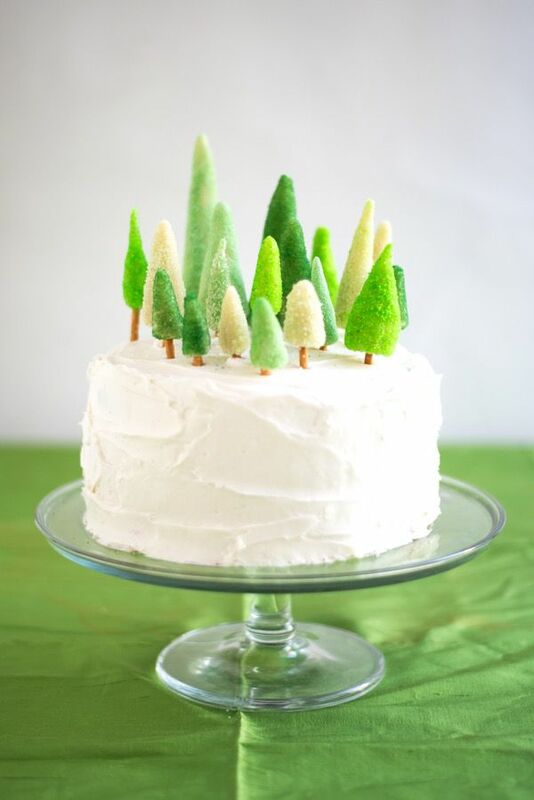 Recreate a winter forest scene on the top of your cake by crafting many little evergreen trees out of sparkling scrapbooking paper and crepe paper to build a forest of different trees that can be attached to toothpicks. Perfect for Christmas or New Year's Eve these brightly colored paper stars are a dramatic way to top your cake and can affordably be made by folding paper to create a variety of 3D stars which can be attached to wooden dowels and stuck into your cake. Celebrate Christmas this year by making these adorable North Pole cupcakes to send with your child to school for their last day of school before Christmas break party. All the children are sure to love the easy to make cupcakes, which can be made using a candy cane and cut paper to create North Pole signs for each cupcake. Get the family excited for Santa coming to their home this Christmas Eve to bring presents for them with some sweet treats that are perfect to eat while decorating the Christmas tree. It might be hard to believe but these mini Santa Hats cupcake toppers are made out of red and white cupcake wrappers and a small white pom pom. Quickly identify the flavor of your gingerbread cupcakes by sticking a mini gingerbread man on the top of each cupcake. The gingerbread men can then have little scarves added using red and white twine to make them look extra adorable. These DIY honeycomb ornament cupcake toppers are the perfect way to decorate your cupcakes for your family's tree trimming party this holiday season. Made out of mini honeycombs and a brass hex nut you can make these cupcake toppers in the time it takes you cupcakes to cool after coming out of the oven.